I have a fear of heights. Actually, I have a fear of just about everything. I don’t like to feel out of control. As a kid, I never really enjoyed those play structures at the park. Monkey bars were never my thing – I prefer my feet firmly on the ground. I liked to swing, but not too high, and never would I jump off the swing no matter how much friends encouraged/challenged me or seemed to enjoy doing it. I didn’t care for slides (though that might have been because I was pushed off the top of one when I had managed to gather enough courage to climb up the ladder). Mostly, though, I didn’t like the bridge that connected one side of the play structure to the other. If it would have been a stable, strong connection, that would have been okay. But those bridges were always the ones that swung, rattled, and shook with every step you took. As I said, I prefer my feet ‘firmly’ on the ground. Every once in a while, when no one else was on the bridge, I would try to make my way across the bridge very slowly. 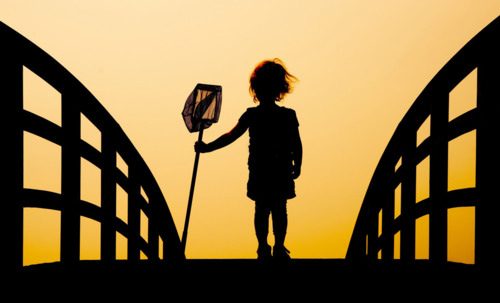 Intellectually, I knew that the bridge would hold me – I watched enough kids run across it – but I’m someone who has a hard time trusting what I haven’t fully experienced. I would take a few steps across the bridge and begin to feel a little more ‘stable’ just as some wild child would go running past me, shaking the bridge and causing me to freak out. I’m not really sure that I ever made it across one of those bridges, but I do know that I’ve helped kids across several times, recognizing the fear and wanting to ensure they had what I didn’t – a hand to hold. Those bridges still freak me out as an adult. Which is probably why the visual God has chosen to put in my head is of that stupid bridge. When I was a kid, I was never really a kid. I had to grow up really fast, and though my wiring lent itself to a natural maturity, I was forced to exercise that maturity way too often. In some ways, I don’t regret being a mature child. It helped to develop some of my analytical skills that I very much rely on in my adult life. But there are times that I really wish I could have been allowed to just be a child. There is a little girl who was locked away just so I could survive and be sitting here today. She never got to fully experience life, and neither did I.
I realized, a while back, that I need to reconnect with that child. Without her, I am not whole. In a lot of ways, she never got to grow up – and I sacrificed my childhood to protect her. She is my emotional side. I locked my emotions away with her so that we would all be protected. Emotions were not allowed in our house so I did what I needed to do to survive. After a while, I forgot about that little girl. As I grew older, there seemed to be less and less of a need for her. I missed her sometimes, but I knew it wasn’t safe for her to come out yet. Over the years, it became ‘normal’ to not feel anything, and I eventually lost touch with that little girl. The time has come to reconnect, but I don’t know how. She stands on the other side of the bridge, and there is a part of me that thinks, “She’s safer over there. If I bring her over here, she’ll have to relive all of those emotions. And what if I’m still not ‘allowed’ to express my emotions? She can keep them safer over there.” Of course, that’s really just an excuse. At the end of the day, it’s me that is ‘safer’ with her across the bridge. I’m the one who doesn’t want to feel all of those emotions. It’s me who wants to stay in control. Mostly, it’s me who is afraid to cross that bridge and bring her back. Not only is the footing not ‘firm’, but there is plenty waiting to stop me, distract me, and push me back to the ‘safe’ side of the bridge. I know it’s time to cross the bridge. I’m just not sure I can make it across. But I cannot be whole without her. She deserves to be free. I deserve to be whole.